The act of abating. Abate: “To lessen, to diminish” (Johnson). Past Tense of Err, "An error, fault; also, erroneous belief, heresy"(OED). “A silk fabric with a glossy surface on one side”(OED). 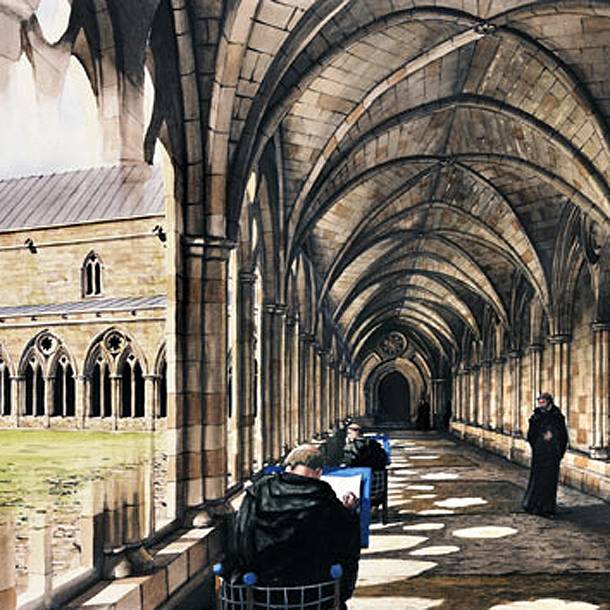 "A covered walk or arcade connected with a monastery, college, or large church, serving as a way of communication between different parts of the group of buildings”(OED). Epiphanies is "the manifestation of a divine being". This continues the pattern of religious beings and references through out the poem. If Moloch could be a representation of consumerism, this passage helps sell the point. The imagery uses is similar to troupes often associated with consumerism, such as the mind as a machine. When I thought of the imagery of ten armies, I didn't actually think of a military army at first but the army of works at factories helping to build the products. Passaic is a city in New jersey built around the Passaic river. "Windows of the the skull", assuming its referring to the eye sockets, seems to be a different spin on the idea of eyes are "windows to the soul". Perhaps instead of inside the soul, the windows of the skull reveal inside the mind? This imagery is interesting as money has so much value in our society. It's a nice contrast of money being not only placed in the trash but burned. Money is usually not worthless but it seems to have little value with this imagery. 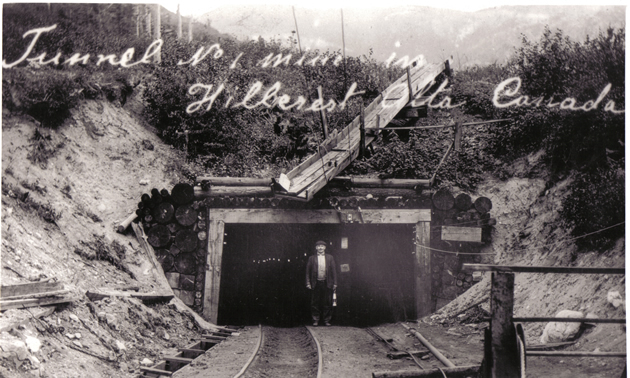 The Mountain passage continues Eliot’s theme of Nature and the effects of human pollution upon it. This instance has a more distinct visual of man’s impact on the world that surrounds us. It focuses not so much on contrasting dirty vs. clean imagery, but on the disfiguration of nature. The “Dead mountain” suggests human intervention as it and the surround lines seem to bring to mind imagery of mining within the mountains. In the line on 385, it evokes this with the line: “In this decayed hole among the mountains”. 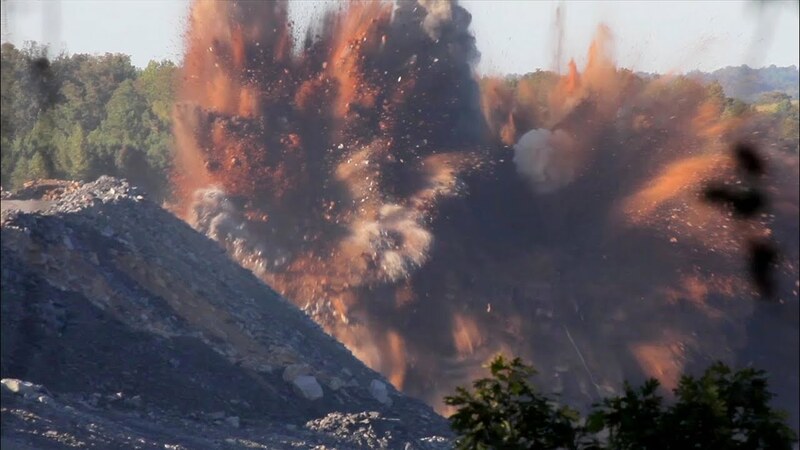 This could be a reference to how we would mine mountains by either blowing them up or digging holes right through them. This hole could be a result of this human intervention. The pollution of nature is seen on the line preceding the dead mountains. Eliot notes how there is no “water among the rock”. It suggests that by our tampering with nature we have driven the key element of life from this area: water. Without water, the life around the mountain will die, leading to Eliot calling it a “dead mountain”. This pattern can be seen a few times in the poem, the idea of a dead land not able to contain life. In line 23 and 24, Eliot states how “[…] the dead tree gives no shelter, the cricket no relief, And the dry stone no sound of water”. The broken mountain can give no protection to life. The dry rocks have no water, as the mountain’s “carious teeth that cannot spit”. Even with out rain there is still “dry sterile thunder” that cannot hurt the land due to it already being dead. As Eliot says, “There is not even solitude in the mountains”. When humans try to change nature, it can lead to disastrous consequences that destroy the land from even the simple pleasures of life and nature. This is not only disastrous for nature but come back to haunt humans as well. Under the brown fog of a winter dawn, A crowd flowed over London Bridge, so many, I had not thought death had undone so many. This passage continues Eliot’s motif of nature throughout the poem. However it does not present nature as pristine. The imagery of a cold winter fog is mixed in with a dirty brown fog, offering a strong contrast between nature and pollution. The “Brown Fog” seems to be a reference to the industrial revolution in Victorian London. During the time industrial pollution was rampant, especially due to the now iconic imagery of the smoke towers of factories around the city. It seems to suggest how humans cause pollution through our industry and our numbers. The brown fog is a result of the dirty smoke mixing in with the clean air, producing a dirty haze. However, we would only notice this contrast because it’s mixing with clean nature. In life we only seem to notice the effects of pollution when they begin to mix in and change the clean nature, giving us a way to contrast the dirty from the clean. Eliot is well aware of this and uses this to his advantage. He pairs the words and imagery together of “the brown fog” (the dirty) with “a winter dawn”, with winter evoking sterile white, clean imagery. Eliot’s poem works in a similar way. The contrast of Eliot’s techniques, poetic and non-poetic, stands out more when thrown in together. The broken pieces of the poem would not be as noticeable if they were separated into their own short little poems. However the fragmented nature of the poem is more noticeable when it is mixed together, contrasting much like clean nature highlights pollution. 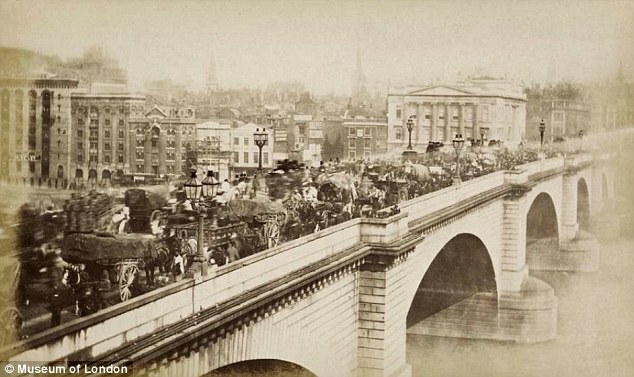 Another interesting note is how directly after the mention of a brown fog, Eliot mentions, “a crowd flowed over London Bridge, so many, I had not though death had undone so many”. The rapid growth of humans seems to be creating a different form of pollution. While their actions effect nature, the growth of the population could be affecting the city itself. Perhaps its meant to suggest the larger crowds dirtying the city like the fog dirties the air. Perhaps the crowd pollutes the city by another means? The line “I had not though death had undone so many” makes the crowd seem like walking corpses. However, Elliot might be suggesting that the crowds are only behaving like corpses. As the city grows, so does society and they way people act in a big city is far different from a small town. Society makes the crowd behave a certain way, polluting their individualism into something the fits in line more with society. Elliot sees them as being “undone” because they have been polluted by society. Hughes has another line in "I,Too,Sing America" that references getting strong. He says "and eat well/ and grow strong". Why do both poems reference getting stronger? What kind of strength is it? Interestingly Hughes has a similar line in his poem "I,Too, Sing America". In his poem he says "but I laugh" after being told to eat in the kitchen. What is it that they are both laughing at? They both mention it after they talk about being excluded. Is the laugh perhaps about them knowing this kinda of treatment will end? That those who separate them from society them will be wrong in the end? Could this be a reference to the violence and anger of the time? In each of these lines there is a lot of contrasts. What might Eliot be trying to say or ask with these contrasts? What is this red rock? What might it be or represent? This is just one of the many examples through out the poem where the speaker says one line and then follows it with a similar line. The difference is she twists a word or two and gives the second line a different meaning. Why is this a recurring motif? what is the significance of it? What might this mean? What kinda of weeds are they and why does the speaker find them necessary. Egg is repeated 3 times in the first part of the poem. What might it represent? Eggs are fragile and can break easily, might this have some connection? With no one to take the wheel and adjust course, the future has no one to direct it. The way forward has no set direction. It may go out of control but it can go anywhere now as well. what might be the significance of Indian Blood? What would cause them to go crazy? Who is he and why does the narrator seem to be afraid of him? Is it an actual sleep he is referring to or an "enteral" kind of rest? Is he awaiting death? What is the promise and why does he need to be here? Does this mean others don't return back from this path? Is he talking about the roads being worn out the same or the grassy area itself? Is this suppose to be a single tree since wood is singular? Or is it a type of tree or are the leaves yellow? While referring to jug, one could also say the same about life in general. Mr. Flood, having seen many friends die, knows how fragile human life can be. At first I though "bird is on the wing" could be a way of saying the birds are migrating. However, I think it actually might be a way of saying that life always and still is on the move. Later he alludes to the fact that his friends have passed. Maybe the birds moving make him realize that even when his time comes, the world will carry on just is it carries on after his friends pass. "Drink to the bird" could be a goodbye to the migrating birds but also to life as he gets ready for the last stretch. He has outlived many of his friends, feeling alone now. Where he had people he cared about, now there is nothing but strangers in his town. With no one to share the last stretch of life, there really isn't anything he feels is worth it "ahead of him". Such a dear girl as she is, and so careful of me! I must not let her find me writing. Interesting how she seems to hold her sister in-law in high esteem, yet is also scared to have her discover her writing. As the narrator mentions in the next few lines, the sister seems to share the husband's ideas that writing is bad for her. She, like the husband, seems to be more controlling rather than truly caring. Since we know that the husband gives her hourly prescriptions, I wonder if this might be the reason she feels so tired that she can not write. Perhaps the medication she takes makes her drowsy enough that she can not write, even though writing might be able to help her more than the prescriptions. This continues the idea of the husband's control over her. Not only does he not let her "stir without special direction" but now we learn he gives her prescriptions hourly. More and more her husband is beginning to seem less caring and more obsessively controlling. The cold statistician wrote down the inches of progress here and there, noted also where here and there a foot had slipped or some one had fallen. To the tired climbers, the horizon was ever dark, the mists were often cold, the Canaan was always dim and far away. Presenting the idea of progress as a mountain gives the passage a nice double meaning. The metaphors used really helps give a visual to the struggle for progress. The spots where "a foot had slipped" or "had fallen" shows the danger of progressing up the mountain. It understandably does make those who seek progress feel "tired". The Canaan, or as google put it "promise land", seems to be farther away atop the cold mountain. He felt his poverty; without a cent, without a home, without land, tools, or savings, he had entered into competition with rich, landed, skilled neighbors. To be a poor man is hard, but to be a poor race in a land of dollars is the very bottom of hardships. This passage puts poverty into an interesting comparison by likening it to a competition, something that seems to bitterly ring true. Unfortunately there are times where we have to view others as competition to live comfortably in life, such as vying for a job or a house. In this passage he is able to articulate truly how much he is at a disadvantage and captures the feeling of hardship he has to endure. St. Gaudens' choice of power is interesting as it helps the idea of him being a man who was a more old school ,traditional thinker. Instead of choosing a form of advanced technology for a symbol of power, Gaudens chooses a more classical idea for power; the horse. While the story has looked at the themes of change and advancements in technology, Gaudens choice is a direct contrast to that, relying on the traditional and reliability of the horse. This passage has a nice contrast to his earlier view/attitude toward the art in the museums. He could apply his knowledge towards them and thus "did not know how to look at the art". However, here he has the exact opposite as he looks upon the gallery of machines. He is able to have a connect to the dynamos that he couldn't with the art, such as in the way he describes the machine with such detail and passion. It suggests that he might view machines as the equivalent to art. A coherer is primitive radio signal detector that was used in radio receivers. They were used based on the research of French Physicists Edouard Branly. Having the final line be a different from the constant lines of "They Lion grow" really helps makes it stand out as more significant. The way the poem ends with"he comes" is very ominous and evokes a chilling imagery of the Lion coming for us. Perhaps it means to suggest that as we feed the Lion (Industry), it is becoming to big/powerful to control and will over take us one day. A really simple yet interesting phrase that helps sum up how we can take nature and twist it into a product or resource for ourselves. As one of the last of the "Out of" structure used in previous stanza, the "gray hills" seem to be the culmination of industrial images used previously. It made me think that through industrial growth and consumption our green hills turn grey as dirt and ash.